Yes, it is possible. And we dermatologists have a fancy term for it: “herpes gladiatorum.” It is also referred to as “wrestler’s herpes,” “mat pox,” or “scrumpox.” In previous posts, we learned that the herpes virus (HSV) is transmissible through various means of contact with other infected individuals and can occur in various places (lips, hands, eyes, genital area, etc…). Well, wrestlers are frequently in close physical contact with each other and with the mat during matches or practice. As such, the herpes virus can spread. Usually, the herpes rash breaks out over the face, neck or arms. The rash can be tingling, painful, and can show the same little blisters which pop and crust over as in other herpes infections. If you suspect that you have a herpes infection (or your opponent has herpes), get it checked out before your wrestling match (or any other close contact sport for that matter). Prevention is key! Yes, herpes can infect your eye. When it affects the front part of your eyeball (the cornea), it is called herpes keratitis. The cause of this herpes eye infection is none other than the herpes simplex virus (HSV). It is the same virus that can cause cold sores/fever blisters/orolabial herpes. In the same way that it affects the skin of and around your lips, it can affect your eye. Herpes eye infection may be accompanied by pain, redness, tearing, irritation, blurred vision or difficulty tolerating the light. You may or may not have little water blisters around the eye. These blisters can not only affect the area around your eye, but also the tip of your nose! Herpes infection of the eye is serious and is an emergency. If you have any concerns of this, see your doctor immediately. The consequences are scarring of the eye which could lead to blindness. Just like cold sores, herpes eye infection can reappear. That’s because the herpes virus can lay dormant inside the nerves underneath your eye and skin. During flares, the virus reawakens and travels to the skin or eye. If you have frequent herpes eye infection, you may need to take a medication to suppress the virus from reactivating. Cold sore - aka herpes labialis or fever blister. This is caused by the herpes virus. 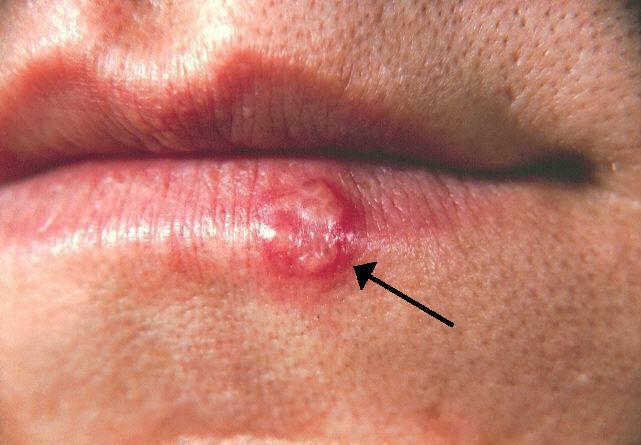 Cold sores, aka fever blisters or orolabial herpes is caused by… you guessed it… the herpes virus. Usually it’s cause by the herpes simplex virus type 1 (HSV1) but type 2 (HSV2) can cause it too. How does it present? Usually there can be tingling or a burning sensation before anything appear on the skin. You can then get some redness and little water or pus bubbles in the skin which can then burst and crust over. You may also notice a fever, sore throat or swollen glands or lymph nodes. How can you treat it? If started early, an antiviral medication such as valacyclovir or acyclovir can shorten the duration and intensity of your cold sores. Ask you doctor about whether these medications are right for you. Herpes is infectious. Especially when you have open sores, don’t share straws, drinks etc. You can also spread the virus via kissing, etc. Try not to shave over the area either. You could drag the virus to nearby skin. Example of herpetic whitlow - a herpes infection of the finger. This was in a young child who had in previous few days had developed infection in the mouth. Courtesy of James Heilman, MD. Believe it or not, herpes infection of the fingers was not uncommon back when healthcare workers did not wear gloves. Touching infected skin, cold sores, mouth lesions etc. with bare hands would transmit the herpes virus. Nowadays, with universal precautions, it’s much less common. Herpetic whitlow is the name given to the herpes infection of the fingers. The finger starts out with pain and tenderness and then little blisters appear. Keep in mind that these little blisters are also infectious. Nowadays, kids are the ones who most frequently get this herpes infection on the fingers — usually from biting their fingers while they have cold sores. Basically, any touching of any other herpes infection can lead to an infection on your fingers. So be careful where the ungloved fingers go!